science content, but also a familiarity with science standards and research on student learning. However, a comprehensive strategy for translating standards and research into instructional, practice has been lacking since the advent of standards-based education reform. 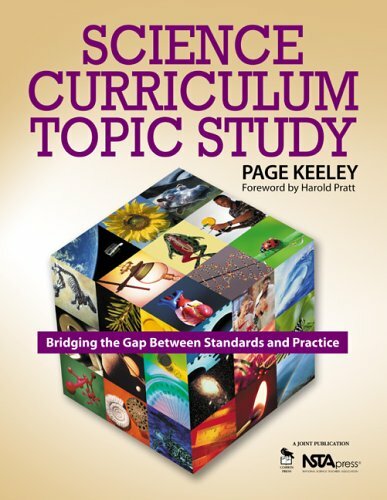 Science Curriculum Topic Study provides a systematic professional development strategy that links science standards and research to curriculum, instruction, and assessment. Developed by author Page Keeley of the Maine Mathematics and Science Alliance, the NSF-funded Curriculum Topic Study (CTS), process can help educators align curriculum, instruction, and assessment with the specific, research-based ideas and skills required in local, state, and national standards. The CTS process will help teachers: Improve their understanding of science content Clarify a hierarchy of content and skills in a learning goal from state or local standards Define formative and summative assessment goals and strategies Learn to recognize and address learning difficulties Increase opportunities for students of all backgrounds to achieve science literacy Design or utilize instructional materials effectively Containing 147 separate curriculum topic study guides arranged in eleven categories that represent the major domains of science, this book provides the tools to both positively impact student learning and develop the knowledge and skills that distinguish expert science teachers from novices. Research; and PRISMS- Phenomena and Representations for Instruction of Science in Middle School, a National Digital Library collection of Web resources aligned to standards and reviewed for instructional quality. In addition she is a co-PI on two statewide projects: Science Content, Conceptual Change, and Collaboration (SC4), a state MSP focused on conceptual change teaching in the physical sciences for K8 teachers and a National SemiConductor Foundation grant on Linking Science, Inquiry, and Language Literacy (L-SILL). Keeley is the author of ten nationally published books, including four books in the Curriculum Topic Study series (Corwin Press), four volumes in the Uncovering Student Ideas in Science: 25 Formative Assessment Probes series (NSTA Press), Science Formative Assessment: 75 Practical Strategies for Linking Assessment, Instruction, and Learning (Corwin and NSTA Press), and Mathematics Formative Assessment: 50 Practical Strategies for Linking Assessment, Instruction, and Learning (in press).Keeley taught middle and high school science for 15 years. At that time she was an active teacher leader at the state and national level. She received the Presidential Award for excellence in Secondary Science Teaching in 1992 and the Milken National Educator Award in 1993. She has served as an adjunct instructor at the University of Maine, is a Cohort 1 Fellow in the National Academy for Science and Mathematics Education Leadership, served as a science literacy leader for the AAAS/Project 2061 Professional Development Program, and has served on several national advisory boards. She is a frequent speaker at national conferences and served as the 63rd President of the National Science Teachers Association (NSTA) for the 2008-09 term.